Ground level decks less than 30" above grade are generally easy to build because they don't involve climbing on ladders and usually don't involve installing guard rails and stairs. In some cases permits are not required for decks less than 30" high. Ground level decks can differentiate outdoor living spaces better than hardscapes such as paver patios. These structures can follow the terrain and blend into the landscape, but there are some unique issues you need to address before you get started. The first issue is clearance. If your door is very low to the ground you may not have enough room to install deck framing and decking without excavating. Digging a few extra inches of soil and grass away will allow you the room you need to build your frame. Building a low profile frame is necessary. You will need to use a flush beam which is set at the same level as the joists as opposed to a cantilever beam. If the bottom of your deck frame is less than 6" above the ground or partially buried you should use pressure treated wood that is rated for ground contact. The higher level of preservative will prevent the wood from rotting and decaying better than standard pressure treated wood. You should never bury hardware in the ground because of corrosion issues. Whether from precipitation draining through the deck boards, or water vapor escaping from the earth, the area under decks are always getting wet. Getting wet isn’t the problem for wood, it’s not being able to dry that can lead to rot and decay.Ventilation is what allows this area to dry, and thus provides a longer service life for the deck. 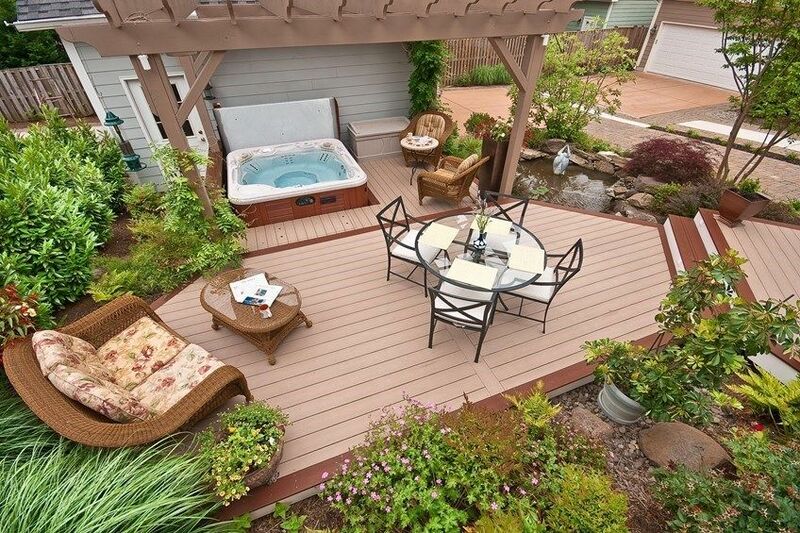 Some deck builders install a layer of gravel or crushed stone beneath the deck to help drain water away. Ground level decks may breed mold without proper ventilation. Make sure the ground slopes away from the house under ground level decks. It is a good idea to space your decking to allow the underside of the deck to breathe. Don't use tongue and groove decking products for ground level decks. Many composite manufacturers require ventilation below their decking products, and this provides a good reference or baseline for establishing ventilation minimums for all decks. In some cases a composite decking warranties may be voided if installed too close to the ground. Generally, if a deck is less than 12 inches above the ground, the perimeter of the deck must be open for free air to flow below the deck. If you are attaching the deck to your house you will need to install footings below the frost line to anchor the deck and prevent the deck from moving as a result of frost heave. Free standing decks may use floating pier blocks which allow the deck to move along with the ground. Some builders build ground level decks directly on top of existing concrete patios using sleepers. Here is an example of a ground level deck. I live in a one story house that sits on a slab, my back door sits about 4" of a concrete patio. Is it possible to build a deck back there?